When we first became vegetarians Andrew bought me a cook book by the name of The Everything Vegan Cookbook by Jolinda Hackett and Lorena Novak Bull (yes me, I was mildly offended, but then realized if I left Andrew to cook we would be waiting F-O-R-E-V-E-R to eat). I should explain that this was also when Andrew was trying to stay away from all types of dairy, including eggs. Eggs are in a lot of delectable items, which means we needed to find a really good alternative for all the breakfast dishes we enjoyed on the weekends. Enter Bananas. Apparently they are what make the world go round for breakfast food. While today we do use eggs, it is usually just because it is the main component of a dish, and we will omit it if we can. 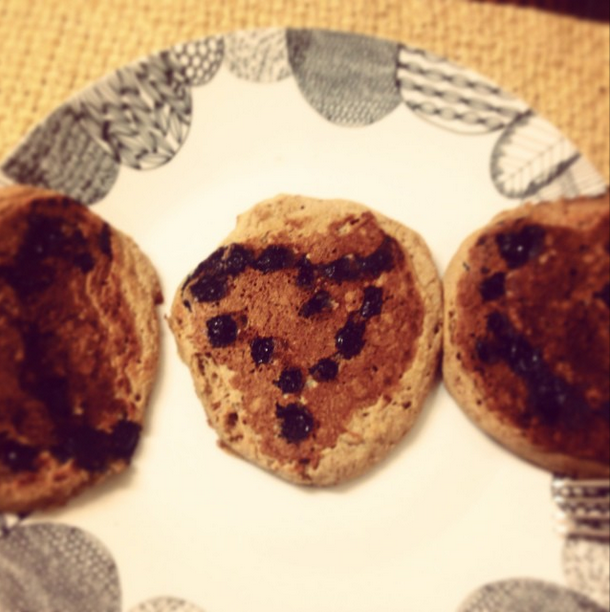 We have kept with the pancake recipe from the Everything Vegan Cookbook simply because it is super easy and delicious. Why add extra animal cholesterol to your diet if you don't have to? And if you are going to say it is good protein, no worries, I get that from the rest of the food I eat (click on this link to read a great and short article that will put your vegan protein worries to rest). So, try these when you need to get rid of the gross banana you don't want to eat. Swap the whole wheat flour for buckwheat if you need gluten free. Add fruits and berries to make it colorful. Definitely add some real Adirondack Maple Cream if you can get your hands on it. Mix together flour, sugar, baking powder and salt in a large bowl. In a separate small bowl, mash banana with a fork. Add vanilla and whisk until smooth and fluffy (the fluffier the better). Let sit for 3-5 minutes. Add milk and stir to combine well. Add the milk mixture to the flour and dry ingredients, stirring just until combined. You do not want to see dry spots. Heat a lightly greased pan over medium heat (use oil or butter, whatever your fancy). Add batter (size of your liking) and heat until bubbles appear on the surface, about 2-3 minutes. Flip and cook other side until lightly golden brown 3-4 minutes. You will get probably 3-5 medium sized pancakes. We recommend doubling the batter....worst case you have more for later! We highly recommend adding some frozen blueberries or raspberries to the batter once it is on the pan. Add dark chocolate chips if you have the craving or what to spell out "love" messages. If you are looking to add fruit as a topping then I would stick to fresh. These are a great option to put out for your friends when you are in a pinch and don't have enough eggs (but for some reason have a few of those ugly bananas around that you forgot to eat but feel bad about throwing out). Whip up the mixture and treat yourself to some morning goodies or evening dessert. The mix will stay good in the fridge for a few days. Enjoy! PS. While Andrew loves these pancakes, they cannot replace ricotta pancakes, specifically those found at Five Leaves and on occasion the ones we make at home for special events.